Following the 2012 season, the Minnesota Twins made the decision to end their time in Beloit. They worked out a Player Development Agreement with the Cedar Rapids Kernels starting in the 2013 season. 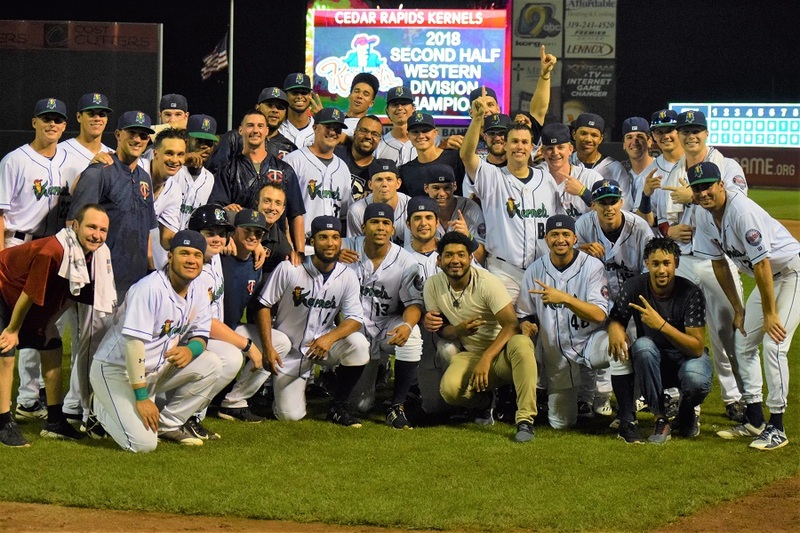 On Monday night, the Kernels clinched a 2018 playoff berth with a win. It marks the sixth straight season (all six with the Twins) that the Kernels will be in the playoffs. Jake Mauer managed the first four teams. Tommy Watkins was there in 2017. Congratulations to Toby Gardenhire and his coaching staff on another strong, successful season in Iowa! Keep reading to find out more on the night in the Twins minor league system on Mondays, please feel free to discuss and ask questions. Agreed. Royce is going to be fine. Let him finish out the season, hopefully he can bust out of the slump before the end, but it's a good lesson for him. Kirilloff is remarkable as a hitter. FSL hasn't fazed him at all, and that's wonderful to see. I'm guessing Lewis repeats the level to start next season, Kirilloff makes the jump to AA. Just a guess. Yeah, I know last year Beeker moved up for one start and then pitched in the playoffs for Cedar Rapids... Rosters certainly subject to change. In all of baseball? I would think he'd be in the conversation, for sure. I was impressed with Rooker. He was far more athletic than I thought he would be. For some reason, I was picturing him as a Daniel Palka/Tyler Austin-type, but he's much quicker than that. He flew in from third on a passed ball. I guess I shouldn't be surprised by this as he's started 42 games in LF for the Lookouts this season, but it was interesting. Versatility can't hurt! That is the exact comment I heard from Jonathan Mayo this spring training when he was in Ft. Myers. He definitely is a good athlete and not just a Palka type. Austin is a pretty good athlete too. Id guess that would be the case. Zero reason to rush them anywhere, but Kirilloff appears ready for AA. Then again, 8 hits in 5+ innings...you can expect to give up a few runs.Bigger picture, I think Romero is wearing down a bit.Game logs/numbers since about mid-July not particularly fantastic.For the year at Rochester, the K/9 pretty significantly down (6.7 K/9 in the last 10 starts)...missing fewer bats.Probably partly a function of working on lowering the walk rate (mildly successful) by throwing more balls over the plate early in the count.But I do think he's wearing down a bit similar to last year...at about 140 innings overall....basically, the number of innings Jake Odorizzi has already thrown.To me, it's too early to say whether innings/endurance are, or are not, going to be a concern for Romero in 2019.